Accounts receivable represents money owed by entities to the firm on the sale of products or services on credit. In most businesses, accounts receivable is executed by generating an invoice and either mailing or electronically delivering it to the customer, who, in turn, must pay it within an established timeframe. Revenue has a big impact on bottom-line profitability, so managers may be tempted to “manage” revenue recognition. accrual accounting: A method of accounting in which funds are recorded when they are earned and deductions are claimed when expenses are incurred. On a company’s balance sheet, accounts receivable is the money owed to that company by entities outside of the company. The receivables owed by the company’s customers are called trade receivables. Account receivables are classified as current assets assuming that they are due within one year. These are the funds management is concerned with when considering working capital requirements. 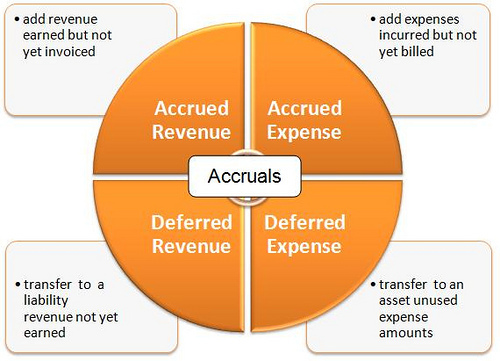 Accrual Recognition: This chart lays out methods for accruing revenue and expenses in accounting. The second method is the direct write-off method. It is simpler than the allowance method in that it allows for one simple entry to reduce accounts receivable to its net realizable value. The entry would consist of debiting a bad debt expense account and crediting the respective accounts receivable in the sales ledger. Managers can sometimes tweak the period in which revenue is recognized to create a more attractive financial statement for a given circumstance. To establish a credit policy, a company must establish credit standards, credit terms, and a collection policy. Management must decide on credit standards, which involves decisions on how much credit risk to assume. Another important factor in determining credit standards involves a company evaluating the credit worthiness of an individual or business. After establishing credit standards, the firm must decide on the length of the period before payment must be made and whether or not they will offer a discount for early payments. The last step is to establish a collection policy. bad-debt losses: losses resulting from an uncollectible debt. Management must decide on credit standards, which involves decisions on how much credit risk to assume. These decisions play a large role in determining how much money a firm ties up in its receivables. A restrictive policy will most likely result in lower sales, but the firm will have a smaller investment in receivables and incur less bad- debt losses. Less restrictive policies will generate higher sales as well as a higher receivables balance, but the company will most likely incur more bad-debt losses and a high opportunity cost of holding capital in accounts receivables. Credit Score Factors: This chart depicts the factors that go into an individual’s credit score. Another important factor in determining credit standards involves a company evaluating the credit worthiness, or credit score, of an individual or business. This refers to the risk that the buyer will default on extended credit by failing to make payments which it is obligated to do. Potential losses not only include the selling price, but can also include disruption to cash flows and increased collection costs. To reduce its risk, the seller may perform a credit check on the buyer or require the buyer to put up collateral against credit extended. Preferred payment discount (such as cash over credit card). Seasonal discount (for orders placed in a slack period for example). Trade discount (usually given when the buyer agrees to perform some function). The last step is to establish a collection policy. Collection policies vary widely among industries. Some companies do nothing when their customers don’t pay. Others send out a reminder notifying customers that their payment is late. Some companies may even take legal action at the first late payment. Character: Is the borrower trustworthy with a history of meeting its debt obligations? Capacity: Will the borrower have enough cash flow to make its payments? Capital: Does the borrower have enough capital to justify the loan? Collateral: Does the borrower have any assets that can secure the loan? Conditions: How are both the borrower and the economy performing and how are they expected to perform? Terms of trade credit include the amount of time allowable for payment to be received, including any potential discounts. Credit terms are often quoted “net X” with X being a certain number of days. An example of a common payment term is Net 30, which means that payment is due at the end of 30 days from the date the invoice is issued. The debtor is free to pay before the due date, and many businesses can offer a discount for early payment. A discount stated as 2/10, net 30 means that the buying firm will receive a two percent discount if it pays by the tenth day, or else they will pay the full amount in 30 days. franchising: The establishment, granting, or use of a franchise. Credit terms are often quoted as “net X” with X being a certain number of days. An example of a common payment term is Net 30, which means that payment is due at the end of 30 days from the date the invoice is issued. Transit time is included when counting the days, i.e. a purchase in transit for 7 days before receipt has just 23 additional days until payment is due to the seller. Other common payment terms include Net 45, Net 60 and 30 days end of month. Net 30 is a term that most business and municipalities (federal, state and local) use in the United States. Net 10 and Net 15 is widely used as well. Net 60 is less used because of its longer payment terms. The debtor is free to pay before the due date, and some businesses offer a discount for early payment. A discount can be offered and stated as “2/10, net 30”. This means that the buying firm will receive a two percent discount if it pays by the tenth day, otherwise they will pay the full amount in 30 days. Markup: This equation shows the finding of selling price for a vendor by adding its markup to its cost. To allow start-ups the ability to manage their inventory investments – effectively giving them a short-term business loan. By tracking which customers pay, and when, the distributor can identify problems that are developing and take steps to reduce or increase its amount of trade credit. Companies use different methods to collect their outstanding receivables, like sending out reminders or employing a collection agency. Collecting on accounts receivable is the final step in the credit extension process, and arguably the most difficult. Accounts receivable days and an aging schedule are tools used to monitor accounts receivable. The accounts receivable days is the average number of days that it takes a firm to collect on its sales. The aging schedule categorizes accounts by the number of days they have been on the books. A company may protect against bad- debts losses by purchasing trade credit insurance. creditors: a person or institution to whom money is owed. Collecting upon accounts receivable is the final step in the credit extension process, and arguably the most difficult. In dealing with collections, it is important for a firm to start by monitoring its accounts receivable in order to determine whether its policy is working to the best advantage of the company. Accounts receivable days and an aging schedule are the most common monitor tools used. The accounts receivable days is the average number of days that it takes a firm to collect on its sales. By comparing this number to the number in the credit policy, a business can determine whether its policy is effective or not. The accounts receivable days is important because investors utilize this measure to evaluate a firm’s credit management policy. This method does have its weaknesses. Seasonal sales patterns may cause accounts receivable days to change depending on when the calculation occurs. Therefore, management can potentially manipulate accounts receivable days to hide important information. The other method commonly used is an aging schedule which categorizes accounts by the number of days they have been on the books. It can be constructed in one of two ways: using the number of accounts or using the dollar amount of the outstanding accounts receivable. If the percentages in the lower half of the schedule begin to increase, the firm needs to evaluate the effectiveness of its credit policy. Payment patterns provide information on the percentage of monthly sales that the firm collects each month after the sale. The payment pattern can be used to forecast the working capital needs for the business. Another way to evaluate a credit policy is to look at the receivable turnover ratio. This is a financial ratio that measures the number of times, on average, receivables are collected during a period. 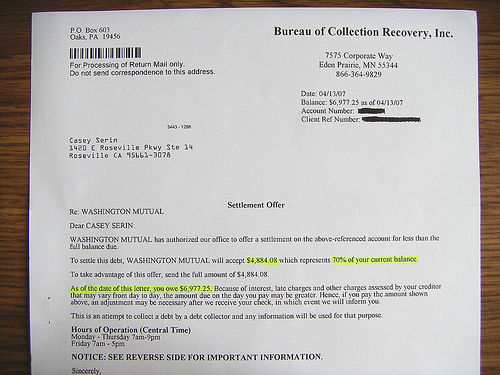 Collection Letter: This is an example of a letter from a collection agency offering to settle a debt. There are several methods companies can use to collect their outstanding receivables. Some do nothing, some send out reminders notifying customers of late payment, and some take legal action – sometimes at the first late payment. If firms so choose, they can utilize a collection agency. A collection agency is a business that pursues payments of debts owed by individuals or businesses. Most collection agencies operate as agents of creditors and collect debts for a fee or percentage of the total amount owed. There are many types of collection agencies. First-party agencies are oftentimes a subsidiary of the original company to whom the debt is owed. Third-party agencies are separate companies contracted by a business to collect debts on their behalf for a fee. A company may protect against bad-debts losses by purchasing trade credit insurance. This is an insurance policy and a risk management product offered by private insurance companies and governmental export credit agencies to business entities wishing to protect their accounts receivables from loss due to credit risks like protracted default, insolvency, or bankruptcy.